In my previous post, I talked about Default End Point in WCF 4 . 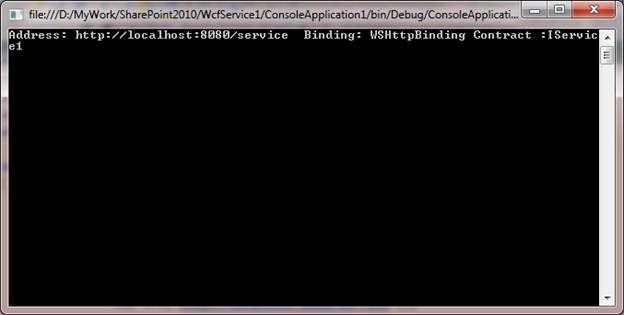 If we closely look at the output that by default WCF maps protocol to binding as below. So if we are not configuring any EndPoint , then for http type base address in default EndPoint created by WCF will have basicHttpBinding. If we see the above mapping , by default http type is mapped to basicHttpBinding , net.tcp type is mapped to netTcpBinding and so on. Now when we do the above change in the Web.Config file then when we do not define any EndPoint then for HTTP type base address, WCF will create the EndPoint with wsHttpBinding. 4. Now we will host this service in a console application, Create a new console application project. Add reference of WCF service application project and also add reference of System.serviceModel in the console application project.